An as yet unidentified man stole two items from a Target store in Nassau County. October 22, 2013 - Hicksville, NY - Crime Stoppers and the Nassau County Police Department are seeking the public’s help in identifying the above pictured subject in connection with a Petit Larceny which occurred in Hicksville, New York. 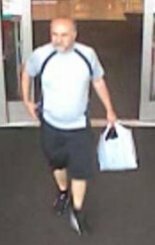 On Wednesday, August 14, 2013, at approximately 2:46 PM, and Friday, August 16, 2013, at approximately 1:35 PM, the subject was observed inside Target located at 2003 Broadway Mall, Hicksville. While present in the store the subject did steal a Blue Tooth Key board, and Switch Gear/Sherpa Laptop Case, and exit the store passing all points of purchase without making payment for the items. The subject fled the scenes in unknown directions. Subject: LongIsland.com - Your Name sent you Article details of "NCPD: Information Wanted on Hicksville Larcenist"